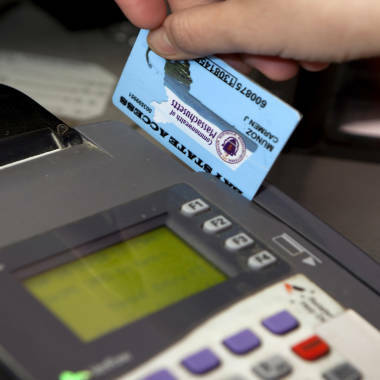 A record number of Americans are using this food stamp card to purchase groceries these days. The number of Americans on food stamps hit a record high in June, and economists don't expect much improvement as long as unemployment remains high. Those receiving benefits through the Supplemental Nutrition Assistance Program numbered 46.37 million, the government announced in a report that hit just days ahead of the monthly nonfarm payrolls report, which the Labor Department releases Friday. The two numbers are inextricably linked as the economy battles its way back from the crippling recession that the National Bureau of Economic Research says ended in 2009. "The unemployment data is not really telling us the true story of how many people are underemployed," said Peter Cardillo, chief market economist at Rockwell Global Capital in New York. Food stamps are "a good indication of how the income of the work force has stagnated and more and more people are applying for food stamps." While the unemployment rate actually has come down from the 10 percent readings it showed in 2009, the number of participants for the SNAP program has soared. There were fewer than 31 million people on food stamps as recently as November 2008, but an aggressive effort by President Obama's administration has helped build participation, with the total increasing by 44 percent since the president took office in January 2009. Liberal commentator Alan Colmes, in a Wall Street Journal op-ed piece Tuesday, cites the expansion as a key achievement of the Obama administration, as participants "only stay on it an average of nine months" and circulate $1.73 back into the economy for each food stamp dollar spent. But if Cardillo is correct and the proliferation of food stamp recipients represents underemployment and wage stagnation, that could signal difficult times ahead for reducing entitlement spending. Cardillo said just 90,000 new jobs were formed in August, and the unemployment rate level was at 8.3 percent. Citigroup economist Steven C. Wieting, in a recent analysis, said there are more than 3 million Americans still without work who lost their jobs following the financial crisis but did not work in the housing-related industries that suffered most. Consequently, he said in an interview, recovery will be slow in coming as those noncyclical job losses will be more difficult to remedy. "The economy's growing and it's likely to continue to grow," Wieting said. "But it's three steps back and one step forward, and lots of cyclical improvement in the economy from very depressed lows. But we are very, very far from having normal labor markets." Indeed, data last week from the National Employment Law Project underscored how far there is to go. The group found that 58 percent of all jobs created during the past two years paid $13.83 an hour or less while just 22 percent were in the "midwage" class of $13.84 to $21.13 an hour, even though that group lost 60 percent of the jobs during the recession. "The economy has fewer good jobs now than it did at the start of the 21st century," Annette Bernhardt, policy co-director at the NELP, said in a statement. "Indeed, it’s important to recognize that the U.S. labor market was already in trouble before the Great Recession, the result of 30 years of growing wage inequality and shrinking numbers of good jobs." Wieting said the economy is "on a path to seven years just to get back to the employment level where you were at the start of the downturn," and suggested the economy is closer to depression than it is to the inflation that would signal sustained growth.